Controversy is brewing over a new beer depot in La Mesa. 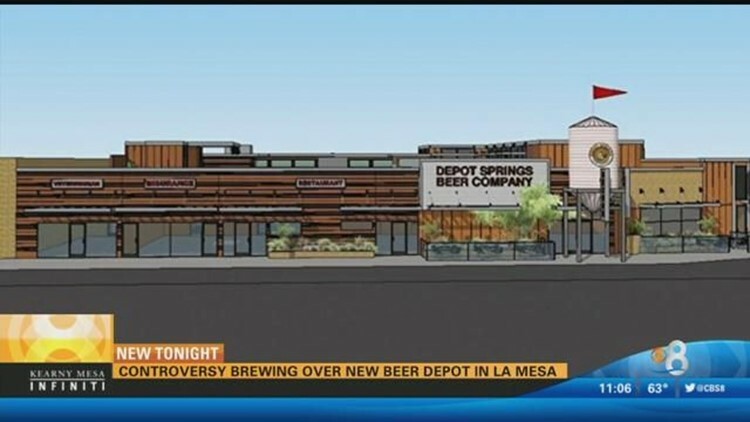 SAN DIEGO (CBS 8) - Controversy is brewing over a new beer depot in La Mesa. La Mesa is home to two breweries already, but the new one set to open along Fletcher Parkway has bigger plans. Depot Springs Beer Company is building its anchor in La Mesa in the Soup Plantation strip mall. As construction begins, Depot Springs Beer Co., said it will be ready to open by the summer. The 25,000-square-foot development will have a restaurant with up to 125 seats, a brewery, a courtyard, live music and a kids zone. Neighbors are concerned about traffic, noise and parking spilling over into their neighborhood. "We love music. We like beer. We like wine and we are all about concerts, but the thing is that we live here," said concerned resident, Pam Ciborowski. Despite an approved noise study, concern remains among residents in the area. Parking is tough enough with the lunch and dinner crowd at Soup Plantation. But there is no stopping the craft beer project. The brewery has the permits, and the appeals process is over. Still, CEO Aaron Dean listened to the community concerns and put the project on hold for four-months to make concessions. "We reduces the size of our building. We reduced the size of our outside stage. We added more of a kid area in the back. We moved our brewery form the back of the property to the front of the property," said Aaron Dean. Dean said he is working with Soup Plantation to re-stripe and move employee parking off site, adding 100 more spots. Additionally, specials will be given to customers who use public transportation or ride-sharing services.